Divorce is expensive. Between child custody and support, property division and spousal support, there are many issues that must be addressed, and thoughtful and thorough legal advice is necessary. If money were not an issue, people would most certainly seek the advice of a good attorney to counsel them and protect their interests in such a stressful, life-altering time. For most people, however, money is a big issue. For that reason, some folks do not seek the legal advice they need, and others seek that advice, and find themselves up to their eyeballs in legal fees. There are ways, however, that you can get necessary legal advice and manage your legal fees in the process. Here are eight tips for how to manage your legal fees while going through a divorce. Schedule an Initial Consultation: In my practice, the main purpose of the initial consultation is to educate a potential client regarding her rights and obligations under the law, as well as to set expectations as to potential outcomes. In addition, it is also important to educate a potential client about the options available for legal services and the expenses involved with each option. For example, it is generally far less expensive for two people to resolve their disputes by agreement rather than court action, and an attorney can provide a potential client some ideas regarding how to approach his or her spouse to work toward negotiating an agreement. Also, some attorneys are willing to take an a la carte approach to legal services when that is beneficial to the client. For example, an attorney can prepare a proposed agreement to the client’s specifications and the client can then act on his/her own behalf to present the agreement to his or her spouse and discuss a mutually agreeable resolution. Understanding the process, setting reasonable expectations and knowing cost effective options can help you manage your fees. Discuss Fees In Detail: At the initial consultation, and before retaining an attorney, have a detailed discussion about the attorney’s fees. Arm yourself with specific questions to ask. Review the Agreement for Legal Services carefully. Make sure you understand what work is billed to you and how it is billed. For example, does the attorney charge by the hour or in some other way? If the attorney charges by the hour, how does he or she keep track of her time? Is an advance payment or retainer required? What portion of a retainer is refundable or non-refundable? Know exactly what you are paying for and monitor the expenses that you incur throughout the representation. Create a Budget for Legal Services. Creating a budget for legal services is not an easy task, but it is a necessary one. Knowing what you have and are willing to spend on legal fees and being forthright with your attorney about that information can help the attorney be a good steward of your resources. Ask questions of your potential attorney in your initial consultation about what kind of budget is reasonable for your specific legal issues and needs. Having a budget can help your attorney guide you regarding what actions will give you the most bang for your buck in achieving your specific legal goals. Prepare What You Can On Your Own. Divorce is paper intensive. Frequently, clients must produce bank statements, tax returns, credit card statements, pay stubs, emails, calendars, and other items. One of the jobs of your attorney and paralegal is to help you with those items: to walk you through what you need, to help organize the documents and to assist you with obtaining the documents, if necessary. Attorneys are happy to provide this service; however, if you can gather these documents on your own, ensure that they are complete (i.e. containing all pages in order), organize the documents in chronological order, if applicable, and label the documents, you will save hours of attorney and paralegal fees. In addition, prepare what you can on your own. For example, in many divorce cases, a client must fill out documentation regarding his income and his monthly expenses. Be thorough, and type the information into the document if you are able. Ask the attorney or paralegal to email you any documents that you can work on yourself, and then do as much as you can and return the document to your attorney by email. Be Responsive. While it is important to us as divorce attorneys to shoulder the legal burden for you, we do require the assistance and information of our clients in order to be able to do our jobs. When we send you correspondence, read it carefully and respond as necessary. When we call you, call us back. When it is time to gather documents, dedicate the time to tackle that task quickly. Make Good Business Decisions. Your attorney is your objective advocate in a time of emotional turmoil. As difficult as it can be, let your attorney guide you in making good business decisions. Paying an attorney $5,000 to negotiate getting the washer and dryer is not a good business decision, no matter how much emotional satisfaction it would give you to get that washer and dryer. Take Advantage of Paralegals and Support Staff. Paralegals are fantastic resources. They are organized, they are knowledgeable, they are helpful, and they are less expensive than your attorney! They can answer most questions about the process, and help you get organized. Review Your Billing Statements. Don’t bury your head in the sand when a billing statement comes in the mail. Open it, review it and ask any questions immediately. Reviewing it will keep you mindful of your budget and how your money is being spent. 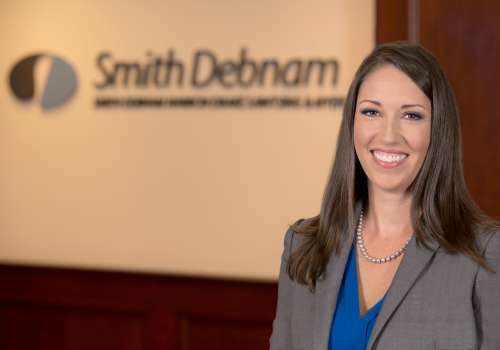 If you have any questions or would like more information on this topic, please contact attorney Lynn Wilson McNally at 919.250.2176 or by email at lmcnally@smithdebnamlaw.com.